In Tenley’s defense, it was cloudy on the Friday when Taylor asked her to join him at the beach for sunset. That’s why she felt no guilt booking a blowout and showing up late… to his proposal. “She had no idea,” he says. And then none again, after she said yes, that her family had flown in for an engagement party at his parents’ home. 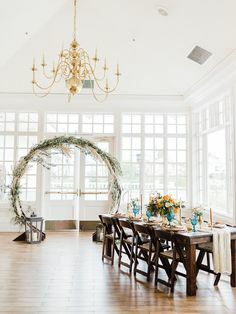 Charmed by the entire evening, the couple couldn’t wait to replicate it at their wedding, electing to tie the knot four months later at Chez Balliet. 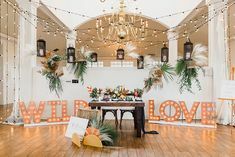 The San Marcos setting had just the right amount of space for their backyard vision to fall into place—a rustic swing festooned with florals, a dessert table turned art installation, tabletop decor, and more. 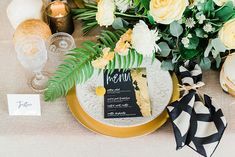 Tenley, too, took the chance to repay her beau’s surprise with something special the night of their rehearsal dinner—a wedding band that had belonged to his late grandpa Jack. “He wanted something that felt like an heirloom,” Tenley says, “and we hadn’t found a ring he absolutely loved.” To her amazement, when she asked his grandma Pat if she could borrow the band for the ceremony, she instead gave it to her to keep. And from perfect bands to forever bonds, by the end of the cloudless day the stars had aligned in more ways than one. “The moment the song ‘Dancing in the Moonlight’ came on, everyone was dancing, and the moon was big and bright,” Tenley remembers—just another sign that, in reality, she’d finally found her Mr. Right. Tenley stunned in Lillian West, donning a sweetheart mermaid gown with allover soft lace, a dropped waistline, and chapel-length train. 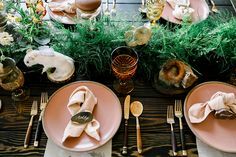 Calligraphy: Dear Darling Calligraphy & Co.
Great Post, Great Idea, Just Love the Pictures & Decor.